'JSB' products offer quality and excellent value. You will always be able to rely on 'JSB' selected products for quality/price combination in whichever category they are found. Made in Germany. B&C fittings are high quality, artisan handmade in Italy of choice woods. Chinrests are fitted with Aluminium Hill-style clamps. 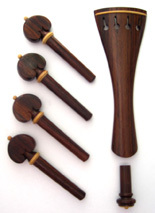 Cello tailpieces have built-in carbon fine tuners that are completely removable as desired. Cello endpins have carbon rods with specially hardened tips. Choice of Chinrest in B&C side mounted model or Guarneri model. JSB Fine Fittings Sets JSB Fine Fittings use only the best of materials and are finished to the finest level of workmanship. All Boxwood used is European Boxwood.